With the arrival of the Roscoe, Snyder and Pacific Railway in 1908, landowner Will Neeley donated the land for a new town. The rather unusual name was meant to honor Neely's eldest daughter. Wastella did develop as a town - and even had a hotel and a few stores, but being just one train stop from Roscoe stifled real growth. 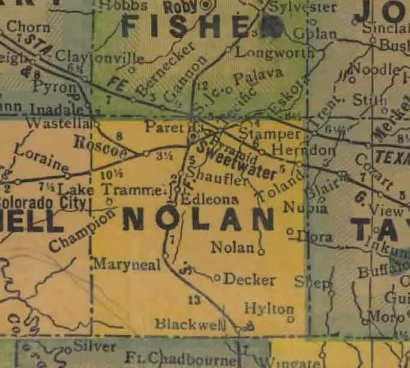 According to the detailed TxDoT Nolan County map, Wastella cannot even claim a cemetery. A post office was granted in 1907 but closed during the Great Depression. The population was reportedly 13 in 1990 - the last figure available. "The town was incorporated in 1907 and then was allowed to remove the incorporation in the 1960’s. One item left out of the [Handbook of Texas] article is that the town intended to drill wells for water. When a well was drilled it was found that the water had gypsum content. 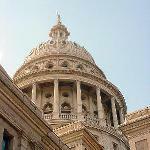 Houses in that part of Nolan county either have to haul water or collect it in cisterns for cooking and drinking." To share history or photos of Wastella (the daughter or the town), Texas, please contact us.